Point Arena Lighthouse is one of the views that make any trip up the North Coast of California worth the while. It is absolutely breathtaking at all times of the day. This trip was more of a scouting exercise to determine what subjects I wanted to return to and give a full treatment. I will be making a trip back up the north coast specifically for this view. The above is a down sampled image if a 300 Megapixel HDR panorama. 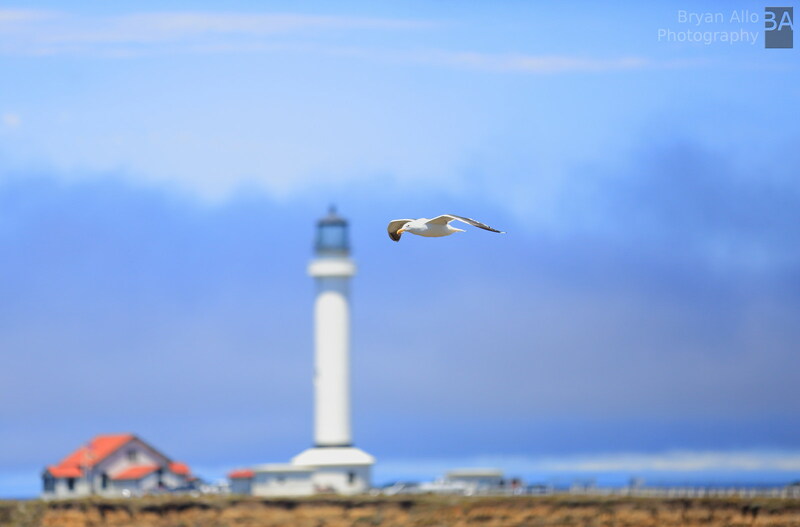 I only allowed myself about an hour to explore this location but after taking my test/scouting shots I couldn’t help but notice the birds swooping down between my position and the lighthouse. I thought just for fun I would try and see if I could catch one of them perfectly positioned with the lighthouse in the background. I set the 5D Mark III to AV mode, AF to center zone, AI Servo for tracking, ISO-400 to ISO-800 for maximum shutter speed. It turned out to be harder than I thought but I did get a few fairly successful shots. Here is one of them. Under these more than ideal lighting conditions the 5D Mark III definitely kept up easily with half the shots. I still missed the 7D’s amazing AF tracking capabilities however. Still this is a very powerful lens and body combination. For this location I shot with the Canon 5D Mark III and the Canon EF 70-200mm f/2.8L IS II USM. For the second half of this session I added the EF 2X extender III. 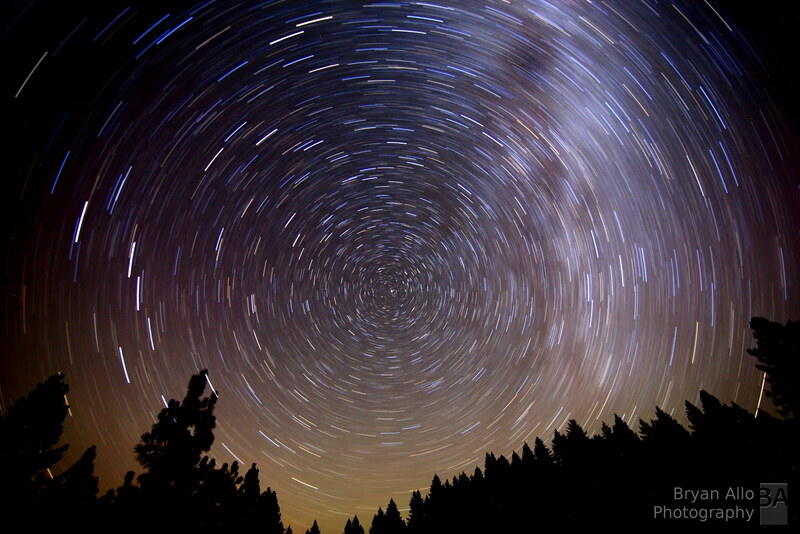 Star trails are a must do, during any astrophotography session. They are perhaps some of the easiest shots to obtain. Simply point your camera towards Polaris (the north star), set your ISO as low as you can go (usually ISO-100) and open your shutter for as long as you can – the longer the better. I took this shot with the 5D Mark III + Tokina 16-28mm f/2.8 @16mm, f/2.8, ISO-100 and a 30 minute exposure. It’s fascinating to see and experience. I topped my stargazing excursion with this shot. If you notice any off-color specs, those are hot pixels. As a result of the ultra long exposure, even at low ISO, the sensor will heat up and introduce this type of noise. The image was not edited. Processing was done with Canon DPP and some color contrast enhancing in GIMP. As usual this July 4th weekend we had several fires in the area so the skies have been particularly hazy which definitely does not help for any kind of viewing of celestial objects. However this morning I remembered the one object that would need more than hazy skies to obscure was available for observation: The Sun. After my DSLR focuser support rail modification the two next items high on my list were an electronic focuser and a solar observation filter for the telescope. Today I decided it was time to put them both to work after installing them late this past week. Getting a shot of the sun is harder to acomplish than I thought. My spotting scope does not have a solar filter so I could not aim the telescope. after trying unsuccessfully for about 15 minutes, I took the cover off the spotting scope and placed the back of my hand behind the eyepiece to see if I could bring the sun within the field of view. Luckily I did not burn my hand but do not try this at home…LOL. Once in range I fiddled around with the fine adjustments on the mount controller until the sun came into view in the eyepiece. The filter is so dark, you cannot see anything until the sun “magically” appears in view. The electronic focuser is completely indispensable, especially with the heavy DSLR attached. The rail works so well you don’t notice it. It will remain on the telescope permanently (Orion should just make all refractors with a rail). 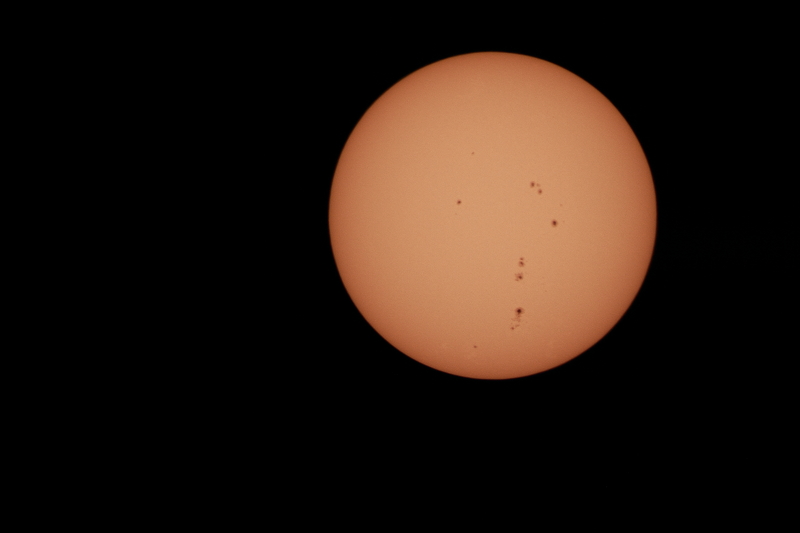 I quickly swapped the 7D back in place of the eyepiece and used live view to fine focus and center the sun. I used a thick dark towel over my head and the camera in order to view the camera screen and get as clear a shot as possible. I will most likely get some kind of solar foil blanket to make this process easier. As a result my focus was not spot on, but good enough for a first run. From that point on it was just a matter of taking multiple shots at various exposures. The 7D was set to manual, AWB, ISO-100, and shutter speeds ranged from 1/2000 to 1/8000 second. Using the RAW files I was able to see the ripples on the surface. They may look like noise but it’s just the enhanced contrast of the surface ripples (note, noise would show up in the dark area of the shot). If anyone has any ideas or tips on how to better process and filter the RAW files please drop a comment below. I’m new to this stuff and I know there are ways to enhance and extract features that would otherwise go unnoticed. The entire telescope and camera assembly were starting to bake in the sun. In a rush to take it indoors, I forgot to take a shot with the Canon EF 2X Extender. I will post those next time I get around to it. You can read more interesting facts about the Sun here. Orion SkyView Pro 120mm EQ 1000mm on Celestron Advanced GT German Equatorial Mount. For quite some time now I have had my heart set on taking the life-long journey into the world of astrophotography. I began studying and researching a few years ago. My initial goal was not to learn all there is to know out there but to simply understand what it would take to successfully photograph DSOs (Deep Space Objects). My whole life I have always read and consumed any media I could find on the subject of astronomy, astrophysics and the science of celestial bodies. Growing up in Cameroon, West Africa, a telescope was definitely a very far fetched fantasy so this is an especially significant experience for me. I had previously never looked through a telescope until about a week ago. I learned enough over the past year to know that for astrophotography, I would need a really good refractor telescope with an aperture of at least 80mm and more importanly I would need a very good german equatorial mount, ideally with GoTo and tracking capabilities. Then I began researching refractors and found out that I would prefer a triplet or at least an apochromatic refractor or doublet. I also concluded that the focal length of most 80mm refractors (under 500mm) did not justify the expense considering I already had a really good 200mm f/2.8 lens and a 2x extender which when combined with my 7D crop factor gave me an effective focal length which was comparable. So that left me with only refractor telescopes with an aperture of 120mm or larger. Needless to say I quickly saw the expense climbing beyond the stratosphere. So I started shopping the used market. 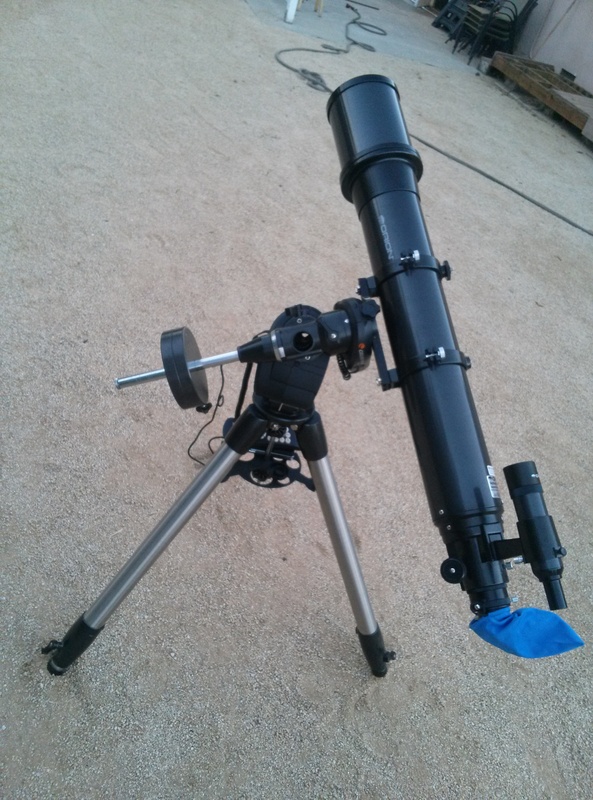 I recently stumbled upon a gentleman who was selling his complete 120mm Orion refractor setup, complete with Celestron Advanced GT mount and auto guide CCD camera scope as well as an assortment of eyepieces, essential accessories and Canon EOS DSLR adapter. There is so very much to learn. This is an opportunity for me to gain a firm grasp of the fundamentals of astrophotography and astronomy in general without getting too heavily invested. I was able to see Saturn and it’s rings within minutes of setting it up and a few more minutes later I was able to attach my 7D and snag a few really blurry shots. The weight of the DSLR on the focuser made it impossible to acquire and maintain focus. So the first order of business was to modify the telescope mount to accommodate the added weight and relieve the focuser of the stresses. You can see photos below of a sliding rail I rigged together with some extra aluminum tubing I had left over from my DIY time lapse track and dolly . This vastly improved stability and focusing in my quick test moon shot. I just ordered an electric focusing motor which should eliminate the residual shake when trying to focus. I’m excited! Focuser camera support rail and carriage modification. Telescope next to the Canon EF 70-200mm f/2.8 IS II for size comparison. Focuser camera rail and carriage.